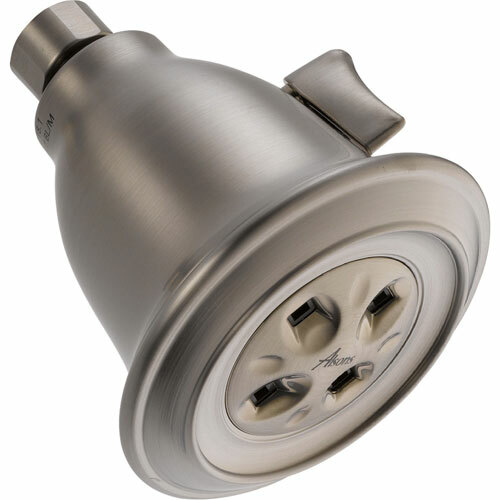 Bask in luxury under this 1-Spray Adjustable gpm Water-Efficient Showerhead in Stainless featuring H2Okinetic Technology. H2Okinetic Technology provides a truly better shower experience. Its warm, drenching water coverage is the result of a denser water pattern and larger droplets that retain their heat longer to soothe and revitalize you. The effect with our water-efficient models is a luxurious, indulgent shower that actually conserves water. Large drops and dense wide spray pattern creates a blanket of water that gives you complete coverage. Getting ready in the morning is far from routine when you are surrounded by a bath that reflects your personal style.